The following example uses Keepalived to make the HAProxy service fail over to a backup server in the event that the master server fails. 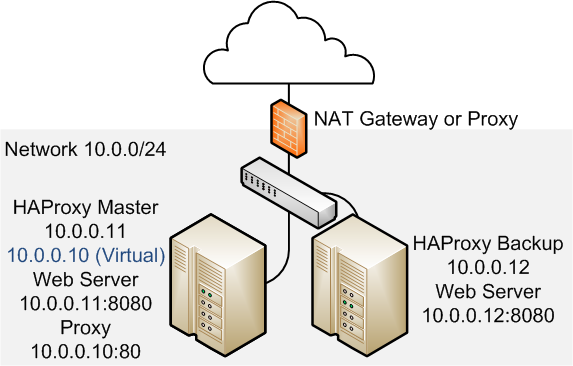 Figure 17.5 shows two HAProxy servers, which are connected to an externally facing network (10.0.0/24) as 10.0.0.11 and 10.0.0.12 and to an internal network (192.168.1/24) as 192.168.1.11 and 192.168.1.12. One HAProxy server (10.0.0.11) is configured as a Keepalived master server with the virtual IP address 10.0.0.10 and the other (10.0.0.12) is configured as a Keepalived backup server. Two web servers, websvr1 (192.168.1.71) and websvr2 (192.168.1.72), are accessible on the internal network. The IP address 10.0.0.10 is in the private address range 10.0.0/24, which cannot be routed on the Internet. An upstream network address translation (NAT) gateway or a proxy server provides access to and from the Internet. The HAProxy configuration on both 10.0.0.11 and 10.0.0.12 is very similar to Section 17.3, “Configuring Simple Load Balancing Using HAProxy”. The IP address on which HAProxy listens for incoming requests is the virtual IP address that Keepalived controls. It is also possible to configure HAProxy and Keepalived directly on the web servers as shown in Figure 17.6. As in the previous example, one HAProxy server (10.0.0.11) is configured as the Keepalived master server with the virtual IP address 10.0.0.10 and the other (10.0.0.12) is configured as a Keepalived backup server. The HAProxy service on the master listens on port 80 and forwards incoming requests to one of the httpd services, which listen on port 8080. 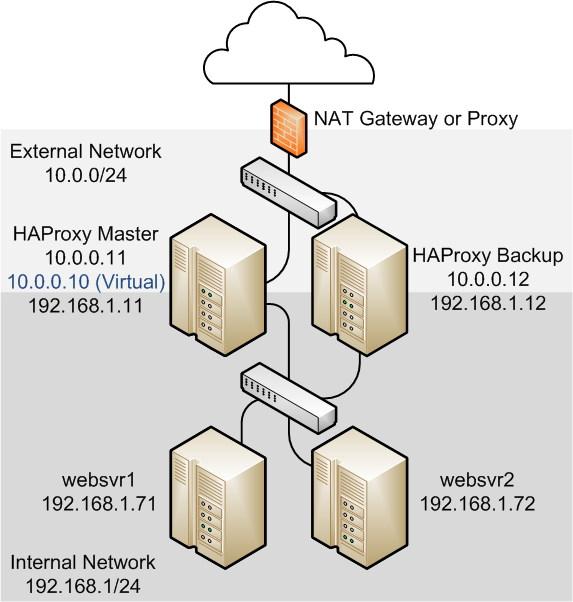 The HAProxy configuration is the same as the previous example except for the IP addresses and ports of the web servers. The firewall on each server must be configured to accept incoming TCP requests on port 8080. The Keepalived configuration for both example configurations is similar to that given in Section 17.6, “Configuring Simple Virtual IP Address Failover Using Keepalived”. In the event that the master server (haproxy1) fails, keepalived assigns the virtual IP address 10.0.0.10/24 to the eth0 interface on the backup server (haproxy2), which becomes the master server. See Section 17.2, “Installing and Configuring HAProxy” and Section 17.5, “Installing and Configuring Keepalived” for details of how to install and configure HAProxy and Keepalived.